Research into eye movement patterns in patients with neurological and psychiatric conditions has a long history, and using eye tracking to study eye movements, has contributed to our understanding and characterization of head trauma, autism, schizophrenia, Parkinson’s Disease, Huntington’s Disease, nystagmus and many other disorders. 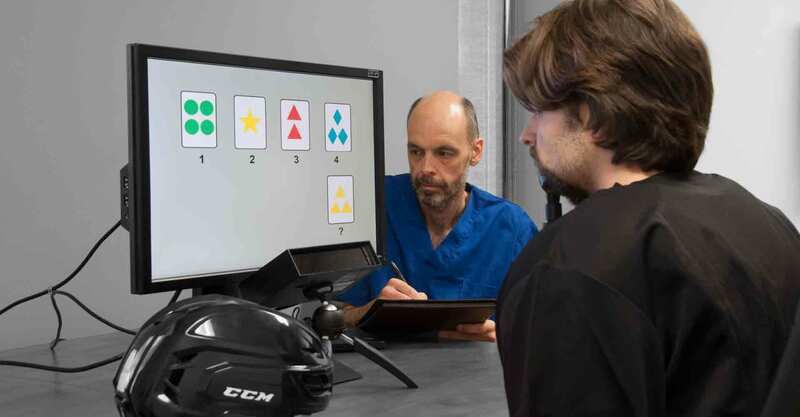 The ability of eye movement data to reveal subtle cognitive and neurological deficits in patients who may not be able to perform standard neuropsychological tests is also critically important. The outstanding spatial accuracy, low noise and fast sampling rates of EyeLink systems allow the subtlest differences in metrics such as fixation duration, saccade latency and velocity, smooth pursuit velocity gain, and intrafixational stability to be measured – allowing researchers to measure deficits and chart changes in performance over time / with treatment. Sampling speeds of up to 2000 Hz (binocular) combined with high levels of spatial accuracy and low noise allow the oculomotor system to be studied in exceptional detail – including microsaccades and vergence. Distinct head-fixed and head free-to-move remote modes ensure that oculomotor behavior can be measured in a wide range of patients, from infants with nystagmus to elderly participants with Alzheimer’s Disease. The Desktop Mount is perfect for standard lab / clinic testing. The EyeLink 1000 Plus can be combined with an Arm Mount, which can be attached to a trolley for bedside testing. The Tower Mount has 60deg trackable range allowing wide range of saccade / pursuit amplitudes to be measured. Multiple options for synchronizing with other recording equipment, including EEG. The Portable Duo is ideal for research testing patients across sites – in clinics or in homes. Easy to transport and quick to set up, the Portable Duo provides laboratory grade data in non-laboratory settings. SR Research Experiment Builder allows users to present a range of stimuli with millisecond precise timing – perfect for a wide range of clinical tasks. Download templates for a wide range of standard clinical tasks, including pro / anti saccade, smooth pursuit, fixation stability and many more. Easilty create gaze-contingent tasks including saccadic adaptation, target blanking and moving scotoma. Use custom movement patterns to generate constant velocity, sinusoidal, circular and lissajous pursuit targets. Present complex stimuli such as images / faces etc for neuropsychological tasks. Binocular recording and exceptionally low noise levels allows vergence eye movements to be studied. Eye tracking functionality can easily be added to existing scripts and test-batteries programmed in a wide range of third-party software solutions, including E-Prime, Presentation, MATLAB and Psychtoolbox, and more. Saccade reports output variables including primary saccade latency, amplitude, duration, average and peak velocity etc. Output Sample Reports containing eye and target position and velocity, for simple calculation of pursuit metrics including velocity gain, RMSE, Log S/N and phase-lag. Low noise data allows the smallest corrective and intrusive saccades to be measured and classified – perfect for microsaccade and smooth pursuit research.